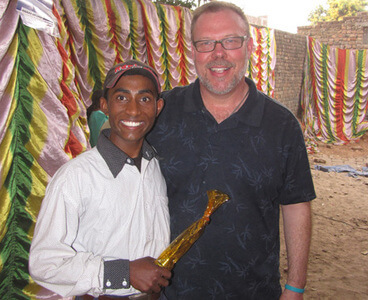 Dr. Greene’s take on India: overwhelmed or great opportunity? The other lesson from Sayedpur didn’t strike home until we visited a nearby similar urban slum called Jethury the next day. In Sayedpur, skin and clothes were dirty and frayed. Flies fed on the mucus running down babies’ noses, without the mothers brushing them away. Eyes looked vacant. Tempers flared. And the situation resolved. Granted they had been waiting for hours in crowded, uncomfortable heat. But in Jethury, when we walked in it was like a different world. The difference was obvious and dramatic. Everyone was eager, clean, and smiling. It was a celebration rather than a confrontation. A key difference? This was a crowd made up of families with at least one child in the Bridge of Hope program. As a result, the children had attention, education, clothes, and at least one balanced meal a day. The good will rubbed off on the parents; it rubbed off on the community. People have asked me if I am overwhelmed by the need in India. No. I am overwhelmed by the possibility. I’m reminded of the Chronicles of Narnia of a time so fertile that even a metal bar would grow into a lamppost. Here, even the smallest gesture has positive effects that ripple through generations. Vitamin Angels is providing ongoing micronutrients to 1 million in India this year, with a goal of expanding this to 10 million by next year. I am so excited to be a part of this effort.